Motor Home Specialist is the #1 Volume Selling Motor Home Dealership in the World. Over $165 Million Dollars to Choose From. New RVs from $17,999 Travel Trailers to Over $2,000,000 Bus Conversions and Every Type & Price-Point in-between. No Games. No Gimmicks. Upfront Pricing on Every Make and Every Model. Minimum 25% Off M.S.R.P. on All New Motor Homes. 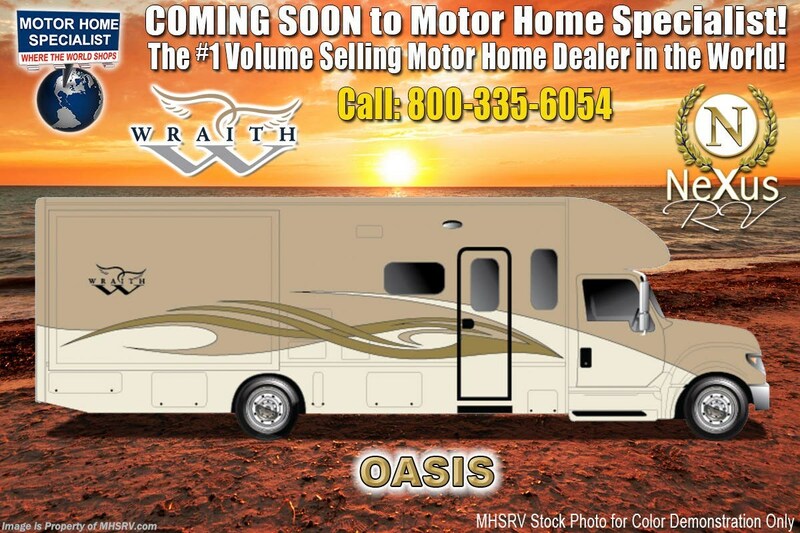 Visit MHSRV.com or Call 800-335-6054.<br />1-2-19 <a href="http://www.mhsrv.com/nexus-rv/"><img src="http://www.mhsrv.com/images/sold-nexus-rv.jpg" width="383" height="141" border="0"></a> M.S.R.P. 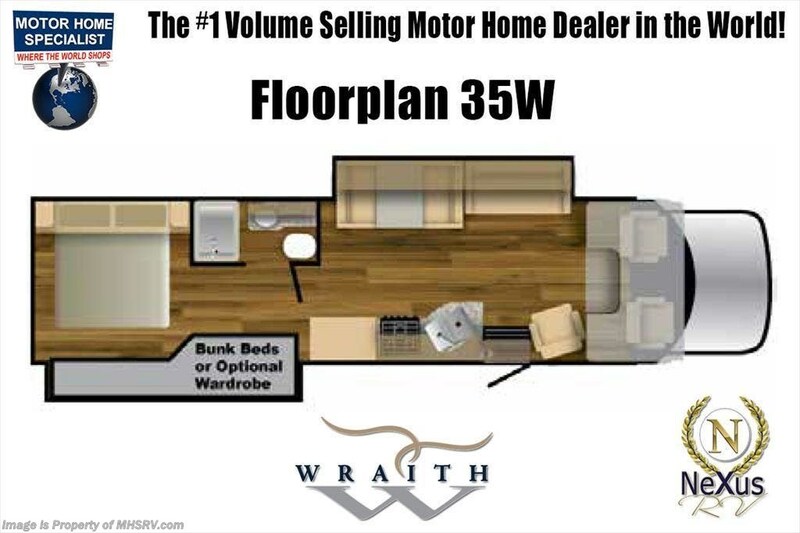 $217,953 - New 2019 Nexus Wraith 35W Bunk Model International Diesel Super C RV for Sale at Motor Home Specialist; the #1 Volume Selling Motor Home Dealership in the World. This unit is approximately 36 feet 1 inches in length. Options include: deluxe 4-color exterior paint, Dark Forest Wood Cabinetry, convection microwave, upgraded A/C with heat pump, Nexair fan, full in-motion satellite, bedroom TV, exterior entertainment center, cab over entertainment center, 8KW Onan generator, 1200 Watt inverter, solar panel, glass shower door, theater seats IPO sofa, deluxe booth dinette, king bed, wardrobe IPO bunk area, roof ladder and side view cameras. This amazing Super C RV also features the Wraith Value Package which includes power driver & passenger seats, water filtration system throughout, heated & remote mirrors, fiberglass roof, HVAC metal ducting and outside shower. Additional features found in the Nexus RV include galvanized steel storage boxes, heated and enclosed holding tanks, upgraded Beau™ Flooring and "plug and play" electrical harnesses throughout the coach making every Nexus RV&apos;s electrical system more dependable. Strength, Safety and Customer Satisfaction are the 3 cornerstones found in every Nexus RV. The strength of the International chassis is nothing short of legendary and the 300HP diesel engine delivers exceptional power and performance. The construction of the Nexus RV far exceeds the industry norm. First, and arguable foremost, the Nexus RV boast an all STEEL cage construction instead of the normal aluminum framed construction found in the competition. Steel cage construction is 72% stronger than aluminum and is only common place is RVs such as the Foretravel Realm or a Prevost bus conversion; both of which would have an M.S.R.P. value well over $1 million dollars! That same commitment to strength and safety is found throughout the Nexus line-up. You will also find construction highlights such as 2 layers of Azdel substrate in the sidewalls & roof! The Azdel product provides 3X the insulation value of wood and is 50% lighter which will help optimize your engine’s performance and fuel economy, and because it is not a wood material harvested from the rain forest it is both greener and provides a less that 1% chance of retaining any moisture that could ever lead to wall separation or mold. It is also formaldehyde free, impact resistant and a sound absorbing material creating a much quieter RV. To further protect and insulate the RV from the elements Nexus utilizes high grade UV protected automotive window seals. The roof is a pre-stamped metal roof truss system that is further highlighted by the exterior layer of seamless fiberglass as opposed to the normal TPO or "rubber roofs" found in most RVs built today. The steel roof is also designed to incorporate Nexus RV&apos;s Easy-Flow Air Distribution system. This HVAC ducting is a tried-and-true system that provides more evenly distributed A/C throughout the coach as well as helps promote cleaner air and reduce allergens. For more complete details on this unit and our entire inventory including brochures, window sticker, videos, photos, reviews & testimonials as well as additional information about Motor Home Specialist and our manufacturers please visit us at MHSRV.com or call 800-335-6054. At Motor Home Specialist, we DO NOT charge any prep or orientation fees like you will find at other dealerships. All sale prices include a 200-point inspection, interior & exterior wash, detail service and a fully automated high-pressure rain booth test and coach wash that is a standout service unlike that of any other in the industry. You will also receive a thorough coach orientation with an MHSRV technician, an RV Starter&apos;s kit, a night stay in our delivery park featuring landscaped and covered pads with full hook-ups and much more! Read Thousands upon Thousands of 5-Star Reviews at MHSRV.com and see what they had to say about their experience at Motor Home Specialist. MHSRV.com or 800-335-6054 - Why Pay More? Why Settle for Less?